January's winner was created by M Gokulakrishnan. Acting drunk can be a complex task for many stage actors. I loved the beautiful expressions and body language. A great treat. Thank you. In your demo reel, a large portion is dedicated to work on Legend of Oz. A famous line from the original movie is that ''there is no place like home''. My question to you, is where is home and what makes it special? Being in the animation field, I spend most of my day time in the studio. And then some night work cannot be avoided as the industry demands it. After a tiresome day I get back to my den, and I ring the bell and I see my wife open the door , and then I walk inside and see my 4 year old son sleeping. Now I get this amazing feeling and all of a sudden my den becomes a beautiful home. Now I call it a den because when they are not around me I feel it’s just an empty shell without any soul. Having them around me makes it home and makes it special. Having said all of this I must add, the next day morning I just can’t wait to go to my studio. If you met the Wizard, what would you ask him for? I would like to know, what is it to be a Wizard; how does it feel? The inside truth, like the real positive and negative feelings of being a Wizard. You have ten years’ experience. How did this journey begin? What inspired you? After my B.F.A (Visual Communication and Design) I wanted to do cinematography because I had developed this interest for the camera and taking pictures during my college days. Photography was part of the curriculum. So now after my Graduation I joined as an assistant to a beginner Cinematographer. I was one of the five assistants, actually number five. I was not really doing good. That’s when I a got call from my father about an animation school in Mumbai. That was it. I moved to Mumbai from Chennai and I went to this Institute and for the first time I really felt this is what I want do. It was fascinating, and even today after twelve years (including my two years in my Institute) I am still fascinated by this beautiful thing called animation. Can you tell us a little about the Indian animation scene? I think currently we are doing pretty good as the quality of the artists is much better compared to what was there when I started. We are doing some great work I guess. Let's not forget animation became well known in India only in the last two decades. Keeping that in mind I feel proud about where we are today. I notice that many of your recent projects have been for Western audiences. In terms of acting decisions and language, how have you found the challenge? Yes. I feel I am lucky to have had the opportunity to work with Western clients. I learned a lot from them. Each project is a great learning experience which helped me in improving my skills. In terms of acting decisions I never had many problems as I watch lots of movies made in the West. I think being an animator one should be able to do any kind of acting or at least be able to learn quickly and keep oneself ready for the production challenges. Being self- updated helps us to survive long in this industry. I guess English is a modern-day universal language. Your 'Brain Camp' piece is 32 seconds long, across a single shot. What advice would you give for producing a sustained character performance over such a large scene? I love to challenge myself. Doing a big shot is always a challenge. It is like a full meal to me. Brain Camp was a test given to me by myself on subtle acting. According to me each shot is a small story. Whether it is 32 seconds shot or a 1 second shot. What is important here is to engage the audience. So the acting choice you make has to be really interesting. Focusing on your winning piece, ''what the heck'', please can you tell us about your animation process? To me it’s all about the idea. Once the idea is clear then there is no stopping. When I listen to a dialogue I think about the best possible natural way to convey it. When I say the best possible way it does not have to be some complex action all the time. It can be simple and must be suitable for the dialogue. It should give life to the character involved and the most important thing is it should be believable. Then I act it out and shoot it only if necessary. While doing “what the heck” I did not have to shoot a live reference as I was clear with the idea and I knew what I was going to do. Then I quickly keyposed it and then the final animation. I could not do the final finesse pass as I ran out of time, because I had to finish the whole thing in the last four days of that month as I heard the interesting audio clip only then. I never expected to win, I just wanted to participate. I love the spin off the couch, the character having to catch her balance while in the mood to party. Where did this idea come from? Some times ideas just pop up just like that. Before starting a shot I just close my eyes and brain storm myself saying the dialogue again and again . When I started “what the heck” that was the first acting choice that came in mind and I found it very interesting. A few changes have been applied since winning the competition. For example, the decision to use a close up at the start of the shot. Please can you talk a bit about these changes? After finishing the shot and after uploading it to 11sec Club, I felt that the secondary character is over powering the main character in the initial few frames. I could not do much about it as it was already uploaded, and actually by the time I realized it, it was too late even to update it. Then, luckily I won the contest and when I received my prize which is the Animation Mentor Expert’s Ecritique he made the same point and he suggested some ideas to fix it. Now I decided I had to fix it. After making some changes, I was still not satisfied. Then, I got this idea of going for a close up and to reveal what is happening by zooming out. I thought this may be more interesting and at the same time it might solve the problem as well. Luckily it worked. Then I made a few changes as per the Animation mentor expert’s (Jean-Denis Haas) advice and these were really helpful in improving my shot. Now I feel the shot looks much better. Thank you Animation mentor. Please can you talk a bit about your approach to animating female characters? Animating a female character is always fun because women are very expressive and they give you lots of options for facial expressions. I don’t have any special approach but it is very important to understand their body language and behavior as an Animator. It can be achieved only by observing them, I guess. Today we can just shoot reference of any action we want to animate. But what is important is to understand what is really happening in that action, not just physically but mentally also. If you just roto the live reference without a deeper understanding it doesn’t make much sense . It is like reading a book which can give you lots of knowledge, but you do not care about understanding the words because you are superficial. It comments how playing drunk is a difficult thing. How did you pull it off? Thank you. But again as I said observation is very important. Then making it interesting in animation is another challenge. It is applying the knowledge you have gathered exactly to the point, but also improvising to make your shot interesting. This is a great challenge and I love this challenge very much. That’s the fun part. When working out movement, I just act to myself or sometimes look in the mirror. That’s all I did in this case. The important thing is realizing the balance when you are drunk. It is always your upper body that leads and then your legs catch up. That’s how you go out of control just swing the upper body and catch up with the legs right at the time and by the time your legs catch up your upper body swings the other way. That’s the principle I stick to. I go with the rhythm of the dialogue. First I decided the story telling layout with the story telling pose of the drunken atmosphere, what I felt was the best. Once that's done my next step was to key pose. Now I decide the poses as per the rhythm of the dialogue. In this case the dialogue was "I am excited and I feel relaxed and I am ready to party with the best of them''. Now I feel this dialogue can be divided into five parts. So we need five important story telling key poses with three anticipations to sell the action. The only rule for the facial expression which I had set was to keep it believable at the same time natural. Not necessarily you need to have a twisted mouth to play drunk all the time. As for as the spin is concerned I had neither used any references nor did I research on it. I just tried what comes to me naturally that’s the truth. You are the first winner using the Mery rig. In comparison to other rigs, what advice would you give for an artist animating her? Mery is a great rig. The character is very beautiful. So what I would try to do while animating her is to keep her facials look pleasant. The expressions can be pushed which is very important but I wouldn’t make her look ugly or off model. What type of characters do you enjoy bringing to life? Nothing specific. I love animating any kind of character. To me what is more important is how challenging the action is. If the action is something very new and at the same time if I had not attempted in the past then nothing like it. Facial Animation is what audiences get connected to. Normally when we talk to someone or watch a movie the emotional connect happens through the expressions. Good expression is always a big plus for the Animation. But anything is possible in animation. According to me, how you time the action is very important. With good timing we can even sell the emotions of a sphere or a cube. To finish off, I wish to leave you with a look at M Gokul's reel. Thank you for your time. Enjoy! February's winner was created by Turkish animator, Ugur Yetiskin. I was introduced to Ugur's work a few years ago, upon the release of his facial tutorials (Animation Scout). I was pleased to see his name pop up as the winner, both for him as an artist and for myself for being able to ask for this opportunity to talk about his work. Your winning entry poses the hypothetical question of how Walt Disney would evaluate the positions of both 2D and 3D animation in today's world. Please share your thoughts on this? All of us animators should be grateful to Walt Disney for where the animation quality is today. They (The Nine Old Men) discovered the main rules of animation and they did wonderful jobs that we still examine their timings, squash & stretch, etc. to be better at what we do. I believe that they are the cornerstones of modern animation. So much that l have one of Walt Disney’s quotes tattooed on my arm. Three of Disney's early cast of characters are Mickey, Donald and Goofy. Which is your favourite? I do really like the character Goofy. He was actually characterized in a clumsy and silly way, though this expo isn’t always distinctive with him. Goofy has shown as intuitive yet clever in his own unique and eccentric way. I believe multidimensional is what makes a good character, and we must admit he is pretty funny. Which other animated characters are you most fond? TMNT is one of my favourites; especially the last movie was very well animated. Furthermore, I still love their parkour movements, heroic attitudes and differences amongst each other. I honestly didn’t but yet l researched some classics frame by frame back at my early years on the field. And l sometimes animate 2D blocking poses for my shot planning with FlipBook program on PC. Well, my journey began with my good old Commodore 64 when l was fourteen years old. My bro loved the games but l was way more curious on how those intros and 3D animations were developed than the game itself. During these years l started to learn 3ds Max with programs help files. During those years there was no tutorials, books or even proper Internet connection – we were connected with 56K! I was graduated from university as a Computer Teacher but l managed to find a job as a graphic designer while I was still struggling with the 3D programs. In a few years l mastered the tools and combined my experiences well enough to land a job offer for the Motion Graphics Designer position. Through all that time I did TV commercials, on-air brandings, promos, 3D models and designs to many brands. I decided to focus on character animation in ’07. I graduated from Animation Mentor and worked on projects as character animator and in a few years l started to lead projects. I’m keep working on my animation projects as freelance jobs nowadays. As well as producing beautiful animation, you possess skills in lighting, modelling and rigging. With each demanding time to learn, how do you manage your development of each discipline? Through my daily routine l work as a 3D generalist to keep myself updated with new programs, plug-ins, workflows, disciplines and furthermore. I surf through inspirational websites to feed my visual intelligence every day. (That includes; 3D modelling, motion graphics, calligraphy, character design, product design and rendering.) When l bump into a challenging projects that l like, l usually try to figure out how l can produce it by myself. I honestly believe that’s the most important part of the learning process. Your series of rigs are available to the community and utilised by schools, including CGTarian. Please can you talk about upon your stance in exchanging animation information and resources. Unfortunately in Turkey, some of the leads in the field keep their experiences to themselves. For that reason I have learned most of the tools all by myself. This led me to experience that keeping knowledge is not the ethical thing to do. I believe that the real wisdom comes with sharing. I also have another tattoo emphasize that belief ;) I never hide any information or knowledge among my community and co-workers. At the end of the day, it’s all about creativity. Your series of tutorials, Animation Scout, provide advice and details regarding facial animation. In what order do you approach the face? For facial animations I use layered animation, which generally refers to the idea of blocking in one part or section of the face at a time. First of all you must examine how the facial muscles work in real life via reference videos for your scene. Layered approach requires careful planning, reference, observation and a fair amount of adjusting different layers to work properly with each other. To begin with, you can find a facial landing pose to work on. (Not rigs, a characteristic default pose.) Then you can layer the expressions, lip-sync, eyedarts and eyebrow movements. Those steps are crucial; you may use asymmetry and arcs for mouth or eyelid shapes. I strongly suggest y’all to watch Jason Ryan’s video on the matter. Please tell us about your animation workflow. I use pose-to-pose animation workflow. They’re more example videos and articles on this than any other alternative. At this point, l just don’t want to bore the readers with the subjects. That’s why l want to suggest Mike Walling’s workflow and Amrit Derhgawen’s article because l pretty much use the same techniques. Which rig did you use? Can you please talk a bit about its modification into Disney? I use CGTarian’s Ray (http://www.cgtarian.com/ray) rig because its body proportions are very suitable for Walter Elias "Walt" Disney. Then I researched Walt Disney’s pictures on Google and videos on YouTube. I decide he generally wore shirt, sweater and tie. His characteristics are his moustache and hairs. Then I adapted these modifications to the rig on Maya. I highly recommend this awesome rig to all animators. Thanks to CGTarian for great support. Walt's turn to the desk is quite large in comparison to the rest of the movements. In your eCritique, the mentor suggests toning this down. Please can you share your thoughts on this? I really tried that at my planning stage with reference video. But I think without a momentum/anticipation there is no possibility to turn and push the chair with legs. I still can try that on my chair while writing these sentences but I can’t do that with little movements. But other critiques have awesome tips and my forgotten points. Thanks to Animation Mentor to provide e-critiques. The audio and performance is quite subdued. What advice would producing an animation of this tone? First I decide where could be the contrast body movements/poses, head accents and expression changes. In that sound I decided to place left hand down before he stared to talk about spheres. I achieved to do that with both movement and visual contrast by raising his hand front of the window to achieve clear silhouette. I wanted to lead audiences eyes with that and making a contrast! But up to that time character movements were still subtle for me and I decide a make big contrast while turning his body and leading audience eye to the classical drawing at the animators desk. With that movement I tried to make big figure 8 movement with characters nose tip. The timing & spacing was too important for me. I tried to break the subdued audio with contrast poses and visual style. I decided all of these at planning phase. I also designed window position, chair height, and desk position for storytelling and staging. I'll leave you guys by show casing his beautiful showreel. Thank you Ugur for your time and I hope you guys enjoyed! 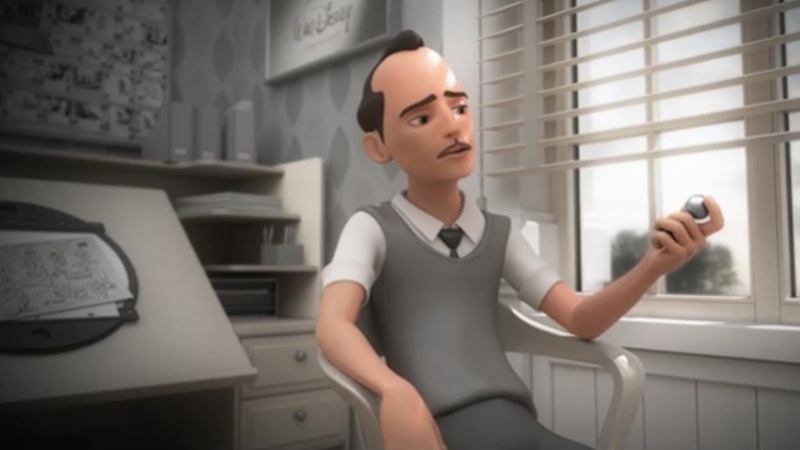 Ugur Ulvi Yetiskin // Animation Demo Reel 2015 from Ugur Ulvi Yetiskin on Vimeo.